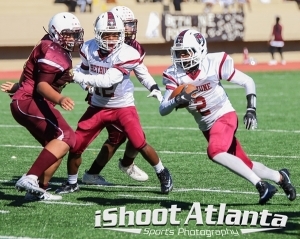 Bethune running back/defensive back Armond Davis scored three touchdowns to lead the Lions to a 33-6 victory over the Tucker Tigers to claim the school’s first ever DCSD middle school football Trail to the Title Championship at Adams Stadium last Saturday. 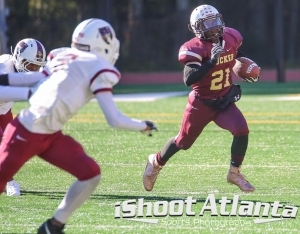 It was Bethune’s fourth trip to the title game including last year’s 38-6 loss to Tucker and the win broke the title drought for the Lions (8-1). Bethune also appeared in the 2008 and 2011 title games. The two teams were knotted at 0-0 just before the half when Davis, the game’s Offensive MVP, broke away for a 20-yard touchdown run. Isaiah Logan added the point after kick to make it 7-0 Bethune with 2:02 left in the half. The score was set up by Sam English’s 25-yard interception return. Davis struck again early in the second half with a 17-yard touchdown run with 6:05 left in the third quarter. The PAT was no good and Bethune was leading 13-0. As the third quarter came to a close and the Tigers driving Davis stepped in front of a pass at the 50 and went the distance with a pick-six to make it a 19-0 advantage in favor of the Lions heading into the fourth quarter. Bernard Mack (100 yards rushing, 1 TD) upped the lead to 27-0 as he broke loose on an 85-yard touchdown run with 5:41 to play. The Lions converted the two-point play. Letrelle Richardson, who had two interceptions in the game, stopped a Tucker drive with an interception deep in Bethune territory. The Tigers (7-2) then got on the board as a Bethune fumble was recovered in the end zone by Tucker’s Nakobi Spurrier with 3:37 to play. The two point conversion was no good. Mack scored his second touchdown of the game on the ensuing kickoff as he returned it 65 yards for the score. The try for two was no good and the lead was 33-6 with 3:06 to play. Richardson helped seal the win with his second interception to end the game. Bethune’s Jaiden Figaro was a key blocker on many of the Lions’ long runs and had eight tackles on defense to get the game’s MVP trophy. Tucker’s Jayqunn Billingsley received the Defensive MVP award with his play all over the field on defense for the Tigers. He also had a long touchdown run called back in the game. The Tigers have set a record of six consecutive title game appearances (2013-18) with two championships (2013, 2017) during a span they lost just five games to go 50-5 while piling up a 33 game regular season win streak broken in Week 2 this year by Cedar Grove. The Lions become just the seventh team to win a title in the 15 years of the Trail to the Title Playoffs joining Stephenson (5), Miller Grove (3), Cedar Grove (2), Tucker (2), Avondale (1) and Lithonia (1).